Cannot be Normal Summoned/Set. Must be Special Summoned with "Knight's Title" and cannot be Special Summoned by other ways. When this card is Special Summoned: Target 1 card on the field; destroy that target. Chevalier Magicien des Ténèbres Ni Invocable Normalement ni Posable. Uniquement Invocable Spécialement avec "Titre de Chevalier" et non Invocable Spécialement autrement. Lorsque cette carte est Invoquée Spécialement : ciblez 1 carte sur le Terrain ; détruisez la cible. Dunkler Magier-Ritter Kann nicht als Normalbeschwörung beschworen/gesetzt werden. Muss mit „Ritterschlag“ als Spezialbeschwörung beschworen werden und kann nicht auf andere Art als Spezialbeschwörung beschworen werden. Wenn diese Karte als Spezialbeschwörung beschworen wird: Wähle 1 Karte auf dem Spielfeld; zerstöre das gewählte Ziel. Cavaliere Mago Nero Non può essere Evocato Normalmente/Posizionato. Deve essere Evocato Specialmente con "Titolo del Cavaliere" e non può essere Evocato Specialmente in altri modi. Quando questa carta viene Evocata Specialmente: scegli come bersaglio 1 carta sul Terreno; distruggi quel bersaglio. Caballero Mago Oscuro No puede ser Invocado de Modo Normal, ni Colocado. Debe ser Invocado de Modo Especial con "Título de Caballero" y no puede ser Invocado de Modo Especial de otra forma. Cuando esta carta es Invocada de Modo Especial: selecciona 1 carta en el Campo; destruye ese objetivo. 블랙 매지션즈 나이트 이 카드는 통상 소환할 수 없다. "기사의 칭호"의 효과로만 특수 소환할 수 있다. ①: 이 카드의 특수 소환에 성공했을 경우, 필드의 카드 1장을 대상으로 하고 발동한다. 그 카드를 파괴한다. 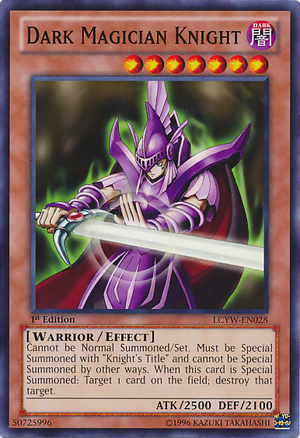 A Dark Magician that has earned the title of a knight. It has gained the mighty power of a warrior. This page was last edited on 18 August 2018, at 16:34.